Hello everyone I hope your week is going well and very positive.beautiful weather here on the west coast of Florida we are in the mid 70's sunny and just so nice. I used my denim Blue Burlap Poinsettias from Crop Stop. a white and Blue tag, bakers twine, cream lace . I sewed around the edge of the Mitten with white thread. and added a piece of twine. Thank you for visiting my blog today it is always a Blessing and Honor to have you stop by. I'd love to have you become a follower of my blog and I would be happy to do the same for you. I always enjoy making new blog friends. Oh how fun!! You made a mitten card too!! 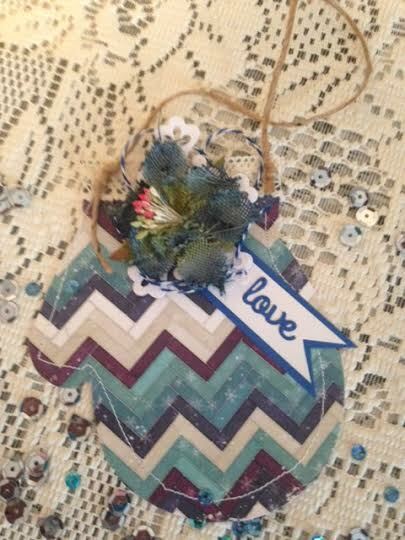 Love your lace, flower, banner, and twine hanger!! Thanks for linking your work to the CropStop Blog!! This is super cute, Dottie. I can tell that you struggled a bit in sewing those rounded corners. I always have a hard time going around curves with my sewing machine also. You did an adorable job. I forgot to use my mitten die-cut this winter. I might need to pull it out this week. You've inspired me! Have a blessed week and thanks again for sharing with us. P.S. i also wanted to let you know that you could share this project over at Paper Sweeties if you'd like. The inspiration photo is snowmen, winter, etc. You could link up there as well if you like.